Cloning and expression of bovine prolactin gene in E.coli . 1997. Dirasat (Jordan). Vol.24, 68-72. Single tube osmotic fragility as a screening test for thalassaemia triat in IRAQ.Fourth scientific Conference of Nahreen university-Medical college.Nov 1998. Breast cancer :Epidemilogical and genetic factors.2002.The Nucleus (India).Vol.xxxxv,No.1,2 Aug ., 44- . Glutathione s- transferase (gsts) genetic polymorphisms among breast and bladder cancer patients in Iraq. 2006.Ibn Al-Haitham journal for science and technology( Jordan). Vol 1.No.2 January., 55-59. The role of SRY gene in some ambiguity cases. (2007).Egyptian –German union of life science.ISSN 1110-5421. Detection of liprospirosis using PCR in Animal samples. 2009.2nd Conference of Genetic engineering and Biotechnology Institute, Baghdad University. CTLA4 gene polymorphisms associated with insulin-dependent diabetes mellitus (IDDM) type 1 in Iraqi population. (2012). Molecular detection of proteus mirabilis using PCR technique among urinary tract infection Patients. (2014).Iraqi journal of biotechnology .Vol. 13,No2.p:35. Demographic study of hypodontia in samples of Iraqi patients. (2014).Vol 2,issue 8. Molecular study of staph. Aureus using RFLP technique of coa gene. (2015).Iraqi journal of biotechnonlogy (in process). Correlation between Insulin resistance and polycystic ovary syndrome in Iraqi women . (2014).Igmms .vol 4 issue 1 : 1434-1436. PCR-based approach to detect the prevalence of exo s. gene in local isolates from otitis (2014). Iraqi journal of biotechnology .vol 13. No. 1 : 61. – Molecular study of Insulin resistance and polycystic ovary syndrome .(2015). American journal f Medicine and medical sciences. Vol 5(3).121-125. Molecular typing of staphylococcus aureus by DNA restriction fragment length polymorphisms of coa gene. (2015). Iraqi journal of biotechnology .Vol 14,No.1 .23-28. Molecular study of insulin resistance and pcos syndrome. (2015). American gournal of medicin and medical science . Vol 5, No. 3 , P 121-125. Detection of subgrouping of Enterobacter cloacae n Iraqi UTI patients. (2017). First conference for biological science , college of women for science , Baghdad university. Molecular evaluation of MMP9 n Iraqi breast cancer patients.(2016). International joural of advanced research . genetic analysis of coagulation factor IX (FIX) gene in a sample of haemophilia B. (2017).Iraqi journal of Biotechnology , vol 16 No. 4 p: 47-54. Invistigation of the inherited mutation related to inversion process of intron 22 in a sample of Iraqi patients with hemophilia A (2017). Pakistan journal of biotechnology Vol 14 , No. 4ovel mutation related with Von Willebrand disease in Iraqi patients .(2017). Journal of global pharma technology . ISSN : 0975-8542. Molecular study of N-ras gene among Iraqi colorectal cancer patient . (in process ). Biochemical and cellular archives (published in 2019). correlation of LIF and glycodeline A in prediction of embryo implantation of infertile women with and without PCOS. ( in process ). Journal of global pharma technology. role of progesterone associated endometrial protein gene variation on impantation rate following IVF program in PCOS women. (in process ). Biochemical and cellular archives. Polymorphism of Angiotensin converting enzyme gene in a sample of Iraqi hypertensive patients and its association with body mass index . ( in process ). Biochemical and cellular archives. Participation in scientific meeting about the Strength of forensic DNA typing in Iraq hold on August 2008 Irbid-Jordan organized by Civilian Research and Development Foundation-USA (CRDF) and Princess Haya Centre of Biotechnology/Jordan University of Science and Technology (JUST). Participation in scientific meeting about the rescue of forensic DNA typing in Iraq hold in December 2006 Petra-Jordan supervised by Iraqis, Jordanian, American and British scientists and specialists. Participation in Training course about molecular detection of pathogens, organized by Civilian Research and Development Foundation-USA (CRDF) and Jordan University of Sciences and technology, 2006 supervised and run by some of American scientists. Participation in training course of forensic DNA( DNA result analysis and interpretation) typing in –Jordan and Saint Joseph University ,Lebonan. supervised by CRDF,USA. 16-28 March 2010. Participation in training course of forensic DNA( DNA result analysis and interpretation) in Jordan. supervised by CRDF,USA. 24 Sept-8 Oct 2010. Application of human Y chromosome and mtDNA in forensic and anthropological investigation. 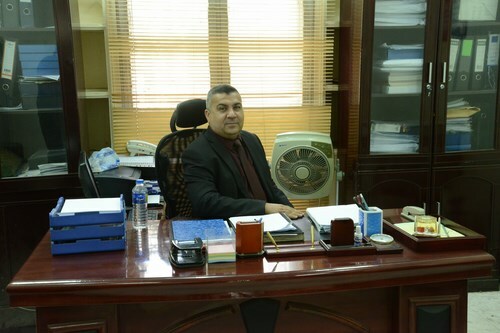 Basrah university college of science 4- 8 /11/ 2012. Iraqi pathogen detection and gap analysis for sustainable capability development. (30 july-1 Aug,2015)Amman,Jordan. Collaboration Training and workshop Los Alamos National Laboratory and public health and Veterinary laboratories. Design Apparatus to elute DNA from agarose .1997. IQC. Stimulate neuclated cell in vitro by electric field . 2001 .IQC. نشاطات اجتماعيه : تبرعات ماليه للحشد الشعبي و للايتام والعوائل المتعففه من خلال الجمعيات الخيريه .